From last few days I was writing posts on Fun Math Brain Teasers. Now let me post some brain teasers which will require logical thinking. These are the picture puzzles in which a object is equated to a number. One has to come up with the logical deduction of this equation and then applying the same rules have to solve for the last object. These Fun Riddles are part of Logical Brain Teasers. Below are the some similar puzzles which you should check to challenge your brain. 1) What Comes Next In The Sequence Riddles With Answers : It contains the logical and mathematical sequence puzzles in which your challenge is to find the next number in the series. 2) Will you crack the code? puzzles with answers : These are purely logical puzzles in which you challenge to find the 3 digit code and then open the lock. 3) River Crossing Challenges with answers : In these puzzles you have to use your logical reasoning to help few people who want to cross the river. 4) Very Tricky Brain Cracking Questions for adults with answers : These are very tricky and tough logical questions which will crack your brain. If you consider yourself genius then do try out these puzzles. 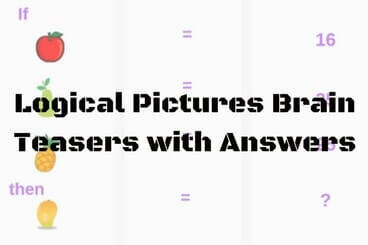 Hidden answers of these Logical Pictures Brain Teasers is given below. Do select the text between the numbers to look at the given answer. First is star , circle, heart , triangle.